Businesses and investors reading between the lines of a legislative proposal targeting shareholder advocacy expect there may be more to it than the text is letting on. Tucked into a Republican lawmaker’s latest plan to scale back financial regulations is a line looking to rework the process that allows shareholders to submit proposals for consideration at companies’ annual meetings. It is one of several items that House Financial Services Committee Chairman Jeb Hensarling (R-Texas) is considering adding to the new version of a bill introduced in the last Congress. The question is how far Republicans might go toward limiting shareholder resolutions. Business groups, which have pushed for an overhaul, say the proposals can be distracting to companies and aren’t always material to shareholders. Shareholders argue they are an important governance tool. Lawmakers should do more than just adjust for inflation, said James Copland, a senior fellow at the Manhattan Institute. “I don’t think that really fits the bill,” he told Bloomberg BNA. The Business Roundtable, a Washington-based association of chief executive officers, has advocated for more sweeping changes to the shareholder proposal process, including making the submission threshold a sliding scale based on a company’s market capitalization and raising the bar for resubmitting failed proposals. The U.S. Chamber of Commerce has also asked the SEC to raise the resubmission threshold. “These are all things that we’re very interested in promoting both through Congress and at the agency,” Maria Ghazal, general counsel for the roundtable, told Bloomberg BNA. The roundtable’s recommendations are aimed in particular at corporate “gadflies,” individuals who own small stakes and repeatedly file common proposals across companies. Three investors and their families accounted for about one-fifth of proposals at Fortune 250 companies in 2016, according to the Manhattan Institute’s Proxy Monitor database. The Business Roundtable’s proposed reforms could also put a damper on environmental and social submissions from pension funds, labor funds and faith-based and socially responsible investors. 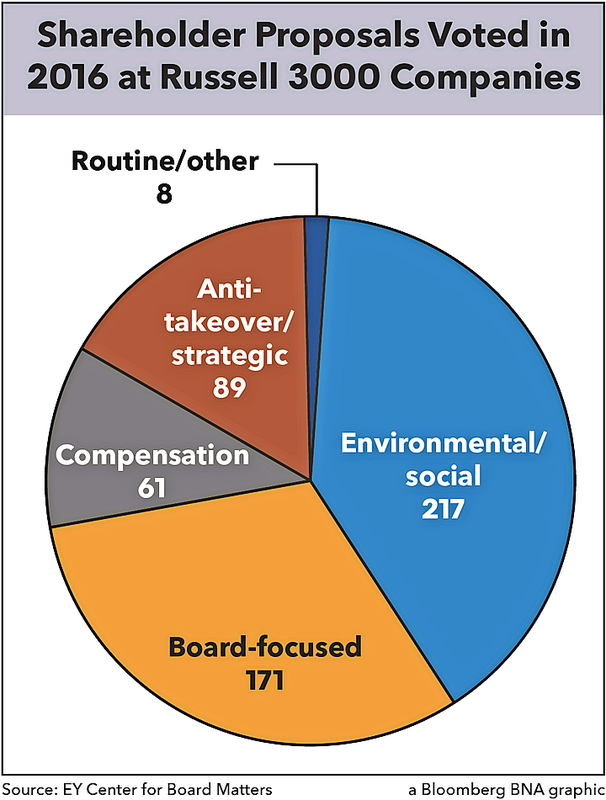 These proposals were the most common type of resolution that went to a vote at Russell 3000 companies in 2016, according to data from Ernst & Young’s Center for Board Matters. “This was set up as a way for shareholders to communicate with management,” said Michael Passoff, the founder and CEO of Proxy Impact, which provides shareholder advocacy and proxy voting services. “The new policies they want to impose would mean only the very largest shareholders,” such as BlackRock, Vanguard and Fidelity, “could communicate with management,” he told Bloomberg BNA. Hensarling's memo to lawmakers is available at http://src.bna.com/mg4.